Santa Barbara may be known the world over for its temperate weather and beautiful coastline, but it is also rich in equine history spanning from the founding of the city and continuing today. In her latest book, Mustang: The Saga of the Wild Horse in the American West, author Deanne Stillman chronicles the history of the horse in the American West and, as described on her Web site, “follows the wild horse from its evolutionary origins on this continent to its return with conquistadors, to its bloody battles on the old frontier to its present plight as it fights for survival on the vanishing range.” What follows are excerpts from Mustang, published by Houghton Mifflin, which hit bookstores in June. 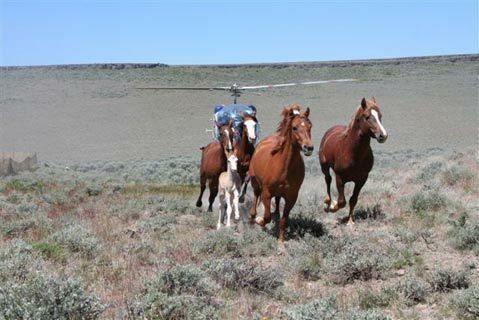 An ill-fated roundup at the Sheldon Wildlife Refuge in July 2006. In 1830, French scientist Jean Louis Berlandier had come to Texas to observe flora and fauna. Among the things he wrote about was a wild horse round-up. The vaqueros had certain words for what happened to mustangs once they were penned in. Sentimiento meant that a horse had died of heartbreak. Despecho meant that a horse had died of nervous rage. Hediondo referred to a corral that reeked of frightened and dying horses. In the holding pen at the gravel pit a few miles from the Nevada round-up that I watched in 2004, I saw many horses that appeared to be on the verge of the first two conditions. I saw a foal trampled by frightened mares and another horse whose leg was bleeding, perhaps injured while being run into the trap. A veterinarian was called and a few hours later he arrived to treat the horse. On the ground near one of the pens was a cattle prod. When I asked some crew members why it was there, they said they didn’t know. As the sun went down, the horses raced nervously to one end of the pen and back, arching their necks, straining to look beyond the fence, some climbing on the backs of others, looking for an escape. Dusk faded to black and floodlights powered by a generator lit up the corral. It was then that I heard a disturbing sound. In other circumstances, it would have symbolized all that’s right with the world. It was the shrieking and laughing of two children-the son and daughter of the crew chiefs-running just outside the fence that circled the horses, spooking the wild animals that only hours ago knew no such sounds, peering through the sheets of jute and calling loudly into the pen as the rest of the crew prepared dinner. The mustangs were scared and had nowhere to run except into each other. After a while, the children moved on and the horses grew less restive. Soon, their heads dropped, lower this time-the spark was fading. The following morning, they were loaded onto two big rigs and hauled away, to the government’s Pyramid Lake holding facility 240 miles to the east. Within a few months, they would meet varying fates. 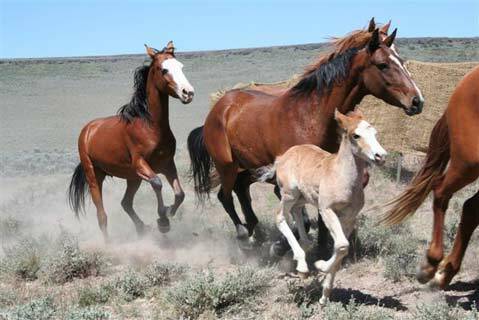 Many would be marketed as “living legends” through the government’s adopt-a-horse program. Some would go to good homes. Others would end up with cruel owners. A few would be returned to the land after being injected with birth control. Some would end up at the slaughterhouse. Throughout time, hundreds would make their way to the various sanctuaries and conservancies around the country. Among them is Return to Freedom near Santa Barbara, started in 1997 by Neda DeMayo, who walked away from a well-paying position in Hollywood when she learned of the government war against wild horses and began learning about them. She visited them in the range and buried herself in obscure records. She read the 1971 act that protects them and studied its modifications and moved on to the numbers and statistics of lengthy government reports. Some of the herds, she found out, were about to be greatly reduced or “zeroed out”-government parlance for complete removal from their homes. She knew that this was illegal but couldn’t stop it. So she raised money and started her sanctuary. Soon she found herself in the role of conservator, taking in large portions of historic herds-descendants of cavalry horses who were living at the Sheldon National Wildlife Refuge on the border of Oregon and Nevada, the Sulphur Springs mustangs in Utah whose ancestors escaped from Native American horse raids on the missions in California, and conquistador horses from the Cerbat range in Arizona. 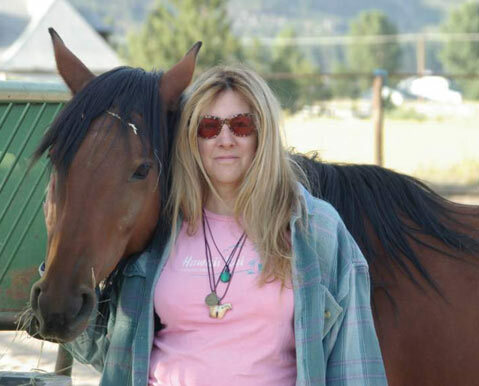 Author Deanne Stillman and Mona, a rescued Nevada mustang, at the Wild Horse Spirit sanctuary in Carson City, Nevada. In the 16th century when conquistadors crossed the Atlantic, their ships became stranded along the equator, where the wind stopped blowing. To lighten their loads, they would throw their horses overboard. So many horses lost their lives in these environs that conquistadors began calling this part of the ocean “the horse latitudes.” But some horses survived and arrived safely in their ancestral turf, and when the conquest was over, Cortes said, “We owe it all to God and the horse.” Today their descendants roam the West, in ever dwindling numbers, but for how much longer it cannot be said. And still, we purge them from the land, throw them overboard, trying to lighten our voyage. 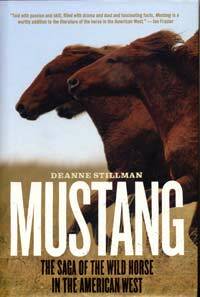 Mustangs is available at area bookstores or can be ordered online at amazon.com. Visit deannestillman.com for more information.